Ever since I got pregnant with Sweet Pea I have been looking for all the beat and natural ways to do things with my children. That has slowly started to trickle over to how I do things over all for my family in general. One thing I was never a big fan of was infants teething medicines so I was so excited when I learned about the amber teething necklaces. Sweet Pea started wearing a amber necklace at around 3-4 months old and is still wearing one. So the idea that adults and older children can wear them to makes me super excited because I know that I deal with a lot of pain issues that the amber could help with. I know as a breastfeeding mother I would experience some pain and discomfort that came along with breastfeeding at times. I also remember how Sweet Pea would love to play with any necklaces I would be wearing so I got to the point that I didn't wear any in fear of the chains getting broke. 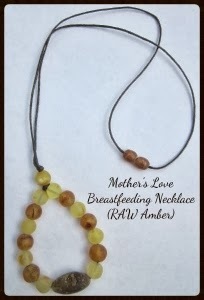 With that said I would like to introduce to you a beautiful amber necklace called " Mother's Love" by Spark of Amber. This beautiful necklace is hand-crafted of authentic raw Baltic Amber stones/beads. These amber rounded beads come straight from Lithuania. Each individual bead/stone is unique and special, so the size and shapes of each bead may be different. Every necklace has its own unique work of art. The coloring may vary slightly due to the natural variations in Baltic Amber. They measure approximately 18"-19" in length. Each of the necklaces are made with care and are quality inspected before ever being shipped! If you are currently breastfeeding or know of a soon to be momma that will be nursing this necklace would make a great gift! It is only available through Spark of Amber for $34.99. You can enter to WIN one of these beautiful necklaces in the "Baby On the Way Giveaway" Event!! I've never heard of amber before. This wasn't available when my kids were little and if it was, I was totally clueless. It would've been nice to have an alternative to oral medications! I love how it looks as well! I have an Amber necklace from Spark of Amber! I use it to help with my eczema flare ups! I love it! I will have to keep this in mind for when lil one is born. Pretty. My son would love to play with this while nursing. I'd love to get him a new necklace for himself for teething. That's a pretty necklace! I need to look into getting an amber necklace. OH! I just got this!! And I love it, It's beautiful! That is so pretty! I love these products that are for mom and baby alike. I never had one of these for my kiddos, but it's something I know we would have benefited from. Love this! I have never used Amber before. I hear great things about it for teething tots though.